I got this news from the News Straits Times Malaysia. I wonder how long is actually the celebration of Mawi and Ekin Wedding. It has been almost 3 weeks if I were not mistaken. Anyway, the wedding reception of singer Asmawi Ani, or Mawi, and Nora’asikin Rahmat was held at Le’Marquee, Palace of the Golden Horses, last night. The event, with a “1,001 Nights” theme, included a luxuriously-decorated harem, fire-eaters and a horse carriage, all featured on the grounds of the premises. The couple arrived at 9pm. 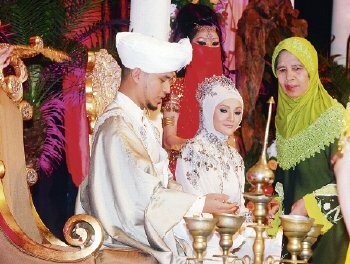 Ekin was ferried on a boat ride before she joined Mawi on a horse carriage. The proceedings included a merenjis ceremony by family members, a cake-cutting ceremony and a fashion show. The ceremony was attended by 1,200 guests comprising family members, friends and fans. Present were Tunku Bendahara Kedah Datuk Seri Tunku Annuar Sultan Badlishah and wife, Home Minister Datuk Seri Syed Hamid Albar and wife, and Measat Broadcast Network Systems chairman Tun Ahmad Fairuz Sheikh Abdul Halim. There were also performances by singer Anita Sarawak, Rabbani, Yasin and former Akademi Fantasia 3 students Marsha, Idayu, Akma and Felix. Hosted by TV personalities Aznil Nawawi, Dang Suria Zainurdin and Aktar Sahari, the ceremony was carried live on Astro Ria. The couple is soooooooooooo romantic! yeah. romantic but took lots of “fortune” to make it happens.. I like Arabian wedding events very much. It is best article for me. Thanks for sharing this useful article.